The world is a fascinating place, full of diverse and majestic wildlife. There are spots all over where you can go to see nature at its best, and one of these very locations is stunning Alaska, USA. This vast habitat supports an abundance of the most sought-after wildlife anywhere in the world, from iconic predators and national animals to creatures straight from the pages of childhood fables. Named for its white head on adult birds, the bald eagle was named by American colonists when bald meant ‘white’, not ‘without hair’. The bald eagle is Alaska’s largest resident bird of prey and has a wing span of up to 7.5 feet, weighing 8 – 14 pounds. The total population is estimated at 30,000. Bald eagle are found along the Alaskan coast, offshore islands, and near lakes and rivers. The highest density of bald eagle can be located in the Southeast islands. In Alaska, the term reindeer refers exclusively to domesticated caribou and this great animal is the only member of the deer family to have both sexes grow antlers. Caribou have been known to travel up to 50 miles a day, and there are an estimated 950,000 in Alaska. Caribou are generally found in tundra and mountain regions where there aren’t many trees, though in winter they can be found in boreal forests. The population of Gray wolf in Alaska is estimated at 6,000 – 7,000. In fact, there is approximately one wolf per 25 square miles in Alaska. Efforts to control the population of this fascinating animal through aerial hunting have been controversial. Wolves tend to be found on the mainland, Unimak Island, and major islands on the southeast. Gray wolves enjoy forest habitats and arctic areas. Alaska contains about 98% of America’s brown bear population, and 70% of the total North American population. In all, around 300,000 brown bears live in Alaska. On Kodiak Island you will find Kodiak bears, the largest type of brown bear in the world. One particularly famous sub-species of this iconic animal is known as the Grizzly bear. 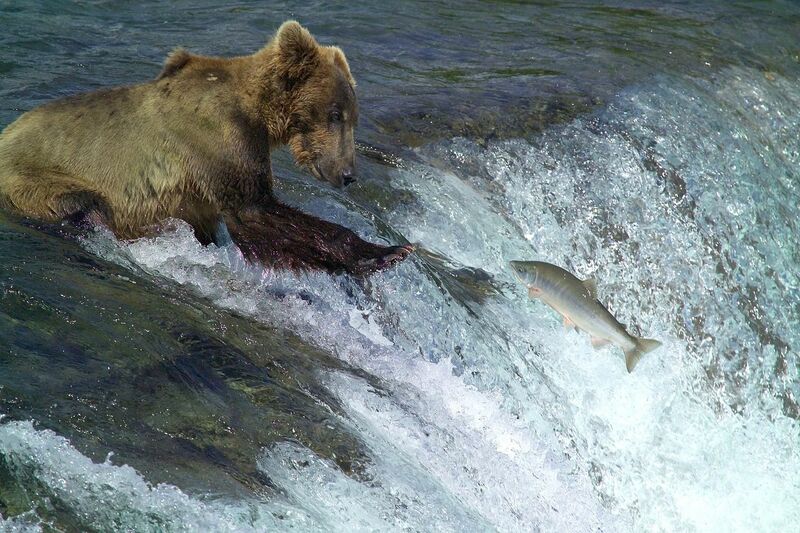 In Alaska, Brown bears can be found in its forests and near rivers. Beaded seals often weigh more than 750 pounds in the winter and are the largest true seals found in Alaskan waters. Bearded seals are solitary and migrate seasonally as the pack ice advances to the Bering Sea. Males are known to sing under water during mating season, and this is partly audible to humans. Locals depend on bearded seals for their hides and for subsistence. Bearded seals are found in waters that rely on sea ice for feeding, resting and pupping.